This weekend sees the Trane sponsored Basingstoke Bison continue their defence of the NIHL South crown with the visit on Saturday of fellow League title contenders Peterborough Phantoms for the final time this season. On Sunday we travel to Milton Keynes to play the Thunder. Saturdays game starts at 6.30pm with doors opening at 5.30pm. Bison currently lie in 2nd position in the league title race with 48 points from 31 games and the Phantoms sit in 3rd position with 46 points for 30 games, so a win for either team keeps them well and truly in the title race. 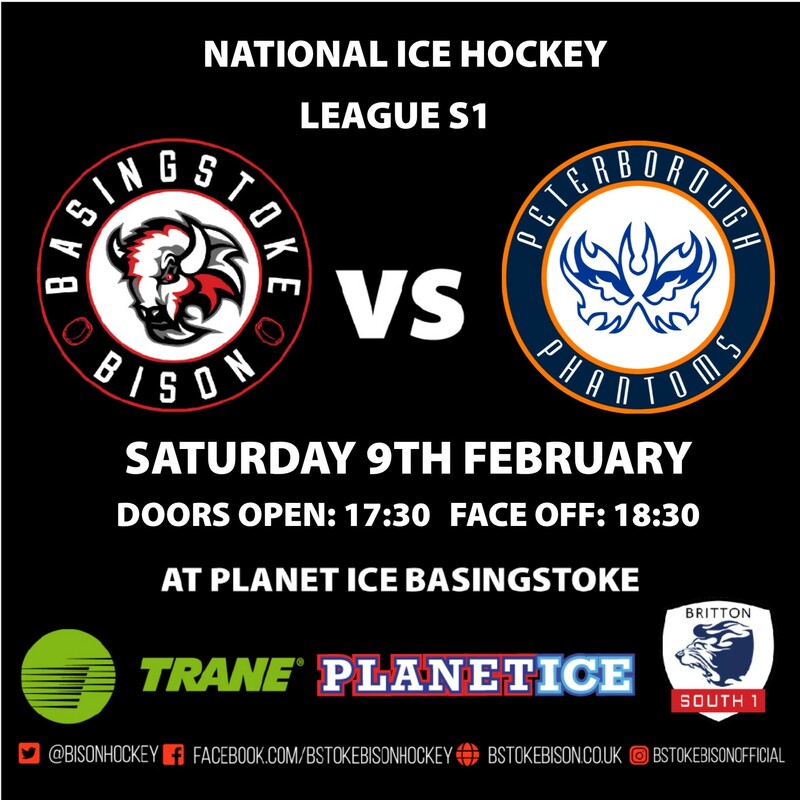 Looking at the head to head between both teams Bison have won 3 games once at home 4 � 3 and twice away 5 -3 and 5 -2 whilst the Phantoms have beat the Bison twice 3 � 1 at home and 2 � 1 in Basingstoke. Looking ahead to the weekend games Bison player/coach Ashley Tait said: �Peterborough are one of the strongest teams in the league, are well coached and have a great work ethic, all the boys know that we will have to be on the top of our game. Games with the Phantoms have certainly been entertaining this season and tomorrows we no doubt be the same.� We will be working hard in training this week ready for the Phantoms, and we can�t wait to take to the ice tomorrow night and be roared on by our noisy and passionate fanbase�. Glenn Billing � Forward � 21-year-old Billing was born in Romford and played the majority of his Junior ice hockey in the Romford set up before moving to the Okanagan Hockey Academy based in Swindon. His senior career has seen him ice for the Milton Keynes Lightning and the Swindon Wildcats and he moved to Peterborough at the start of 2017 / 18 season. Glenn has represented Great Britain at both U18 and U20 level and in the 2016 / 17 World Junior Championship (D1B) he was voted top player on the GB team. Jordan Marr � Netminder � born in Lochgelly, Scotland, 27-year-old Jordan last season, protected the pipes of Elite league side Fife Flyers, he played 19 games for the Scottish side whom finished top of the Gardiner conference. Previously Jordan spent most of his junior career in Canada and America playing in the Midget AAA, IJHL & NCAA 111 leagues, before returning to the UK to pull on a MK Lightning jersey in 2015. In the 2016 / 17 Jordan spent part of the season in the EPIHL with the Hull Pirates, before he moved to the Elite League, when he iced for the Edinburgh Capitals. Jordan has represented Scotland at U11, U13, U15 and U17 levels. Sunday�s game faces off at 6.45pm at the Milton Keynes arena when the Herd will be looking to avenge the narrow defeat, they suffered last time out against the Thunder.